Sometime in prehistory, people discovered that a piece of glass placed atop a shiny metal looked nicer than the glass or the metal itself. The ancient Egyptians used this principle and shaped pieces of glass to glue into metal compartments to make elaborate jewelry. Eventually, it was discovered that glass would adhere to metal if it were melted onto it. The term “enameling” was eventually used to describe this process. The earliest known objects with glass fused onto metal with heat were found in a Mycenaean tomb on Cyprus and date to the 13th century, B.C.E. The glass fused to metal technique spread from Cyprus to Greece and from there to all Europe. Enameling thrived in the Byzantine Empire, in Medieval Europe, and eventually in Japan and China. Precious metals, particularly gold, were used in the early history of enameling; enameled objects tended to be small, and transparent glasses were used to show the gold base. Copper became the most common metal base for enamel in medieval times. The easy availability of this less expensive metal encouraged the enameling of larger objects and the development of enamel wall art. In addition, opaque glasses were fused onto copper, and this greatly expanded the way enamels could be used as an art medium. Enameled objects and enamel art become common household items in the 18th and 19th centuries. Enameled objects were so popular at the turn of the 20th century that paint manufacturers developed a glossy paint and claimed that it looked just like glass enamel. They called this paint “enamel”, a name that stuck. To avoid confusion, glass enamels today are sometimes called “glass on metal”, “vitreous enamel” or “porcelain enamel”. Arresting and revolutionary uses for enameling have developed over the centuries. The 20th century introduced outdoor enameling. Large enamels were created for architectural purposes. One such enamel by Stefan Knapp was 200 feet long, fifty feet high, and formed a complete exterior wall of a large department store! The term enamel refers to a thin coat of glass fused to a metal surface through intense heat. The appearance of glass on metal is different from all other surface coatings. Enamel finishes attract attention without being garish or extravagant. The different degrees of transparencies, the wide variety of arresting colors, and the limpid depth of the colors all give enameled surfaces an elegant quality not found with other surface coatings. In addition, the glass colors are virtually fade proof. Colored glass maintains its vibrant color over many centuries. Glass is fused onto metal in an electric furnace at temperatures from 1300 F to 1700 F. The process is quite complex, and knowledge, skill and experience are necessary to apply enamel to metal. Each individual metal expands at a rate different from other metals when it is heated; the glass that is to be fused to each metal must be formulated to expand at a similar rate as the metal. Thus, there are different glasses used for enameling brass, aluminum, and copper. Certain low carbon forms of steel and cast iron require a special coating to be enameled. The glass that is used for enameling is most frequently pulverized into a fine powder and applied to the metal by sifting or mixed with a liquid and painted or sprayed. Chuncks of glass can also be fired onto the metal to create a variety of color effects and surface textures. Very thin gold and silver foils and wires can also be embedded in the enamel surface. 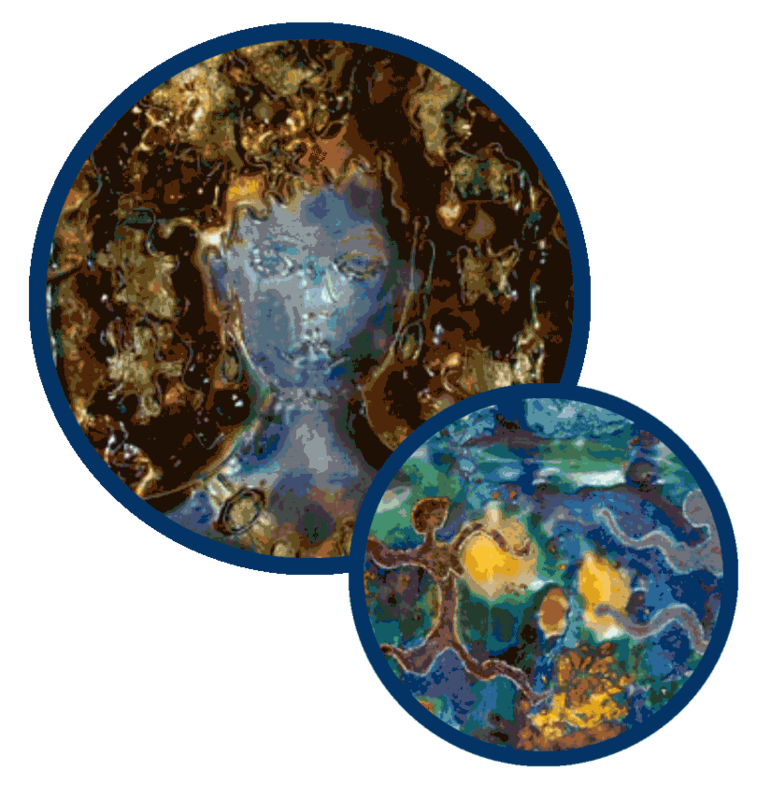 Enameling glass can be transparent, opaque, or translucent. Most enamellists use a combination of these to create the most interesting effects. 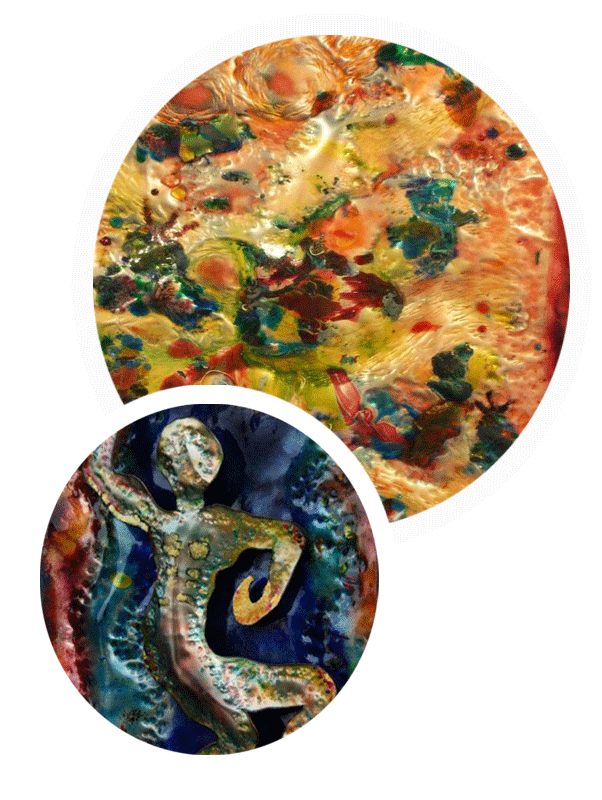 Enameled objects are often coated, one glass layer upon another to build a depth of color. Enameled objects are fired many times. Red hot objects are taken out of the oven, another layer of enamel glasses is applied, and the object is then reinserted into the hot oven. An enameled object is often baked and baked again ten to twenty times in this fashion.